College is a place for new ideas, and what better time to show them off than during a Homecoming parade? One of the most innovative North Texas parade entries of the ’60s and ’70s was a physics project. 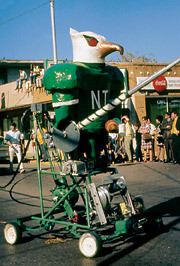 The Mean Green Machine was a large eagle robot created in what the Campus Chat reports as a “bull session of physics students” in the summer of 1968. Students put together a committee and debated the project for several weeks. The idea was then presented to the Society for Physics Studies. “The Beast,” as he was nicknamed, was born. In the beginning the 11-foot, 750-pound robot had four wheels, a three-horsepower electrical engine and an Army-surplus generator. A 50-foot umbilical cable trailed the machine, running to a remote control board mounted on a truck. The robot could turn 120 degrees and extend his right arm as three people operated the controls in the truck. “It looked like we’d just put it together the night before, and I’m sure that’s what all the people thought,” said physics student Clayton Teague (’78 Ph.D.) in an article recounting the robot’s birth. The next year, covered with bright green papier-mache and carrying a football, the machine emerged from the basement to once again compete. This time his voice stalled a block from the judges’ stand. Nevertheless, he managed to win for his creators first place in craftsmanship. The society named him the official physics department mascot. Although he was missing from the 1971 Homecoming parade lineup, the Mean Green Machine returned for the Downtown Holiday Parade that December sporting a Santa cap, flashing red eyes and a paint job by art students. Other departments made signs to promote the machine, and thereafter, he made several Homecoming appearances.